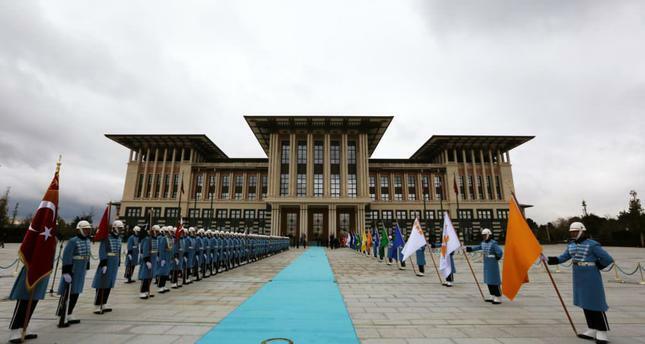 The Presidential Palace complex, reminiscent of the Seljuk style, was opened last year in the Atatürk Forest farm in western Ankara. Fed up with a prolonged campaign over the alleged high expenses of the new Presidential Palace, the Presidency of the Republic of Turkey increasingly counter the rumors through its website. On Monday, a new feature of the presidencies website was introduced: a virtual tour of the compound in Ankara's Beştepe. Viewers can access 360-degree rotating panoramic photos of several venues, from the main entrance where President Recep Tayyip Erdoğan welcomes his guests to the halls where meetings are held. 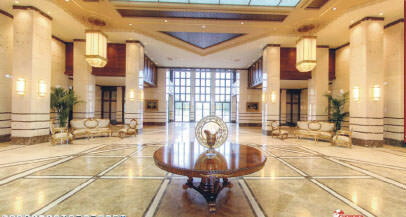 Photos reveal that the palace, although far from humble, is not overtly luxurious as claimed. The palace, which opened in October, was criticized by the opposition for its cost and size. The presidency dismissed the criticism, stating that the palace was not built exclusively for President Erdoğan and was planned as a long-standing structure that will accommodate the needs of the presidency. Erdoğan himself said the palace was built for the nation. "This is an artifact that Turkey will hand down to future generations," Erdoğan has said earlier. Nevertheless, this did not deter the ongoing criticism. The Ankara branch of Chamber of Architects is the harshest, yet, the most clueless critic of the palace apparently. The chamber occasionally releases statements on the apparent astronomical expenses of the palace, which is referred to as "külliye" (social complex) by President Erdoğan, based on the assumption of the presidents critics, rather than any concrete evidence. Last week, the chamber claimed that the cost of the enormous round table where the president hosted an iftar dinner was TL 240,000. The president's office denied the claim and announced the table simply cost TL 4,600 and the cutlery seen on it in photos was not gold-plated as it was claimed. Erdoğan himself denounced the claim as "slander". Then, the presidency released a time-lapse video showing the preparation of the dinner table and it was revealed that the large round table was actually composed of almost a dozen tables joined together to accommodate the president and its guests. The panoramic tour of the palace also includes the dining hall where the fabled table is located, although it is worth noting that the table looks rather small in the spacious hall. Last month, Kemal Kılıçdaroğlu, leader of the main opposition Republican People's Party (CHP) had claimed the toilet seats in the Presidential Palace was covered with gold, sparking a war of words with the president. Erdoğan denied the claim and had invited Kılıçdaroğlu to the compound to inspect the toilets himself. Kılıçdaroğlu later retracted his remarks and turned down the invitation. Sprawling over an area of 300,000 square meters, the presidential compound includes one main building, another building for meeting with visiting heads of state and dignitaries, guesthouses, gardens, a park and a congress center. Erdoğan, in October 2014, moved into the new compound from Çankaya, the iconic presidential mansion in the eponymous district of the capital. The complex is located in Atatürk Forest Farm, a vast forested area hosting a large farm founded by Mustafa Kemal Atatürk, founder of the Republic of Turkey.